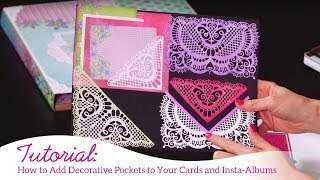 Bring a touch of whimsy to all of your paper craft creations by creating your very own decorative pockets ideal for heirloom albums, scrapbook layouts and handmade greeting cards with the Decorative Pocket Accents Die. First, create a pocket using your favorite decorative paper and the pocket opening die in the size that you wish to incorporate! Next, choose and die cut the decorative pocket accent design you wish to use as an overlay to the opening, and then simply adhere your decorative accent piece over top! The decorative overlays not only add interest and beauty to your project, but also act as a reinforcement for the pocket sleeve, strengthening it, while also assisting you to slip your photos in and out of the pocket with ease!